MOSCOW, April 5. /TASS/. More than 980 refugees were evacuated through the Djleb checkpoint from the Rukban camp, located on the US-controlled area, on Thursday, Major General Viktor Kupchishin, chief of the Russian center for reconciliation of conflicting sides in Syria, told reporters on Friday. All the refugees were taken to temporary accommodation centers in the city of Homs, he added. 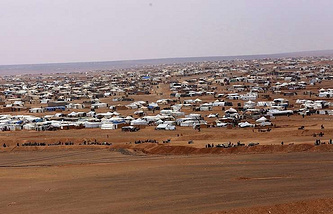 "On April 4, at least 985 civilians left the Rukban refugee camp through the Djleb checkpoint. They all were taken to temporary accommodation centers near the city of Homs. They have been provided with required professional assistance and have been given meals and accommodation," he said. The general recalled that a safe exit through the Djleb checkpoint, where bus convoys had been sent to, had been organized to evacuate refugees from the Al-Tanf zone. The Rukban camp is located inside the zone. "In the past 24 hours, militants have attacked Khara, Aleppo in Aleppo province; Hikha, Krah in Idlib province; and Mahara, Sqalpiya in Hama province," Kupchishin added.